Although this sofa is a bit hard, it was well worth the money. It is absolutely gorgeous. The fabric is very nice and the tufted nails really make it look very expensive. Great size for apartment living. Elegant and eye-catching, the stunning Chesterfield Living Room from Meridian Furniture is the perfect addition to any space. 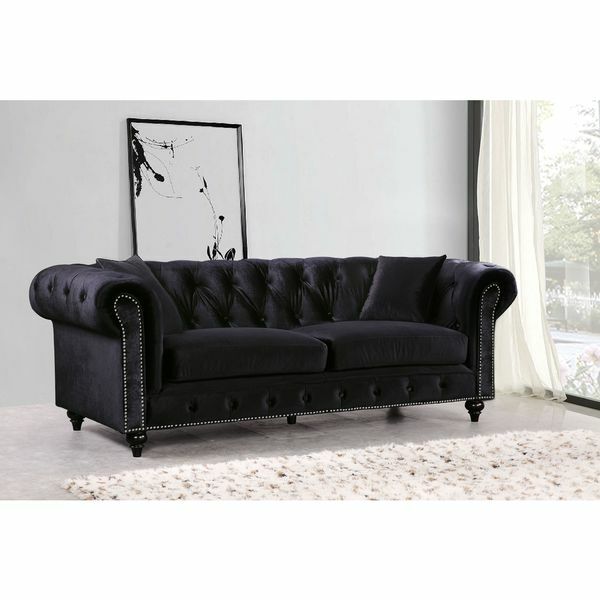 Rich Velvet covers the plush, comfortable seat, padded with high-density foam and modern tufted design. Strength and beauty is guaranteed with a solid wood frame and legs. Features a nail head design on the arms and includes matching throw pillows. "What are the measurements of this couch?" The sofa is 31 inches high x 87 inches wide x 38 inches deep. If your living room is looking drab, then it's time for a decor overhaul. Infuse your space with personality simply by styling around your existing furniture. You can use new decor and a fresh color scheme to breathe new life into your space.